There are so many different angel statues, but whatever catches your eye brings a personal message. 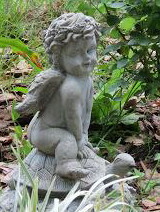 I couldn't help but smile when I first saw this little cherub enjoying a ride on a turtle's back. Turtle represents bringing heaven to earth, and these two have teamed up to fulfill the mission. Just because we have the ability to speed through our days doesn't necessarily make us winners. The turtle won the race with the over confident hare, so this endearing statue brings a message for me to slow down and enjoy each moment of the ride. Victory is assured if I will keep my mind up in the higher altitudes, with my both feet grounded on earth.